All international orders Please request an invoice through sales@pslotcar.com for correct shipping charges due to limited shipping options through Paypal. Flexi Fanatic Mossetti Patriot series on one side,JK cheetah series on the other. 3 sizes of rear axle posts 2mm 3/32",1/8". 4 1/2" front axle posts,includes all stainless steel hardware,plus 1)2MM, 2)3/32", 1)1/8" build axles 4 1/2" long. Cheetah 11 style chassis's C-11,C-21,X25,X24, the .025 C-11. 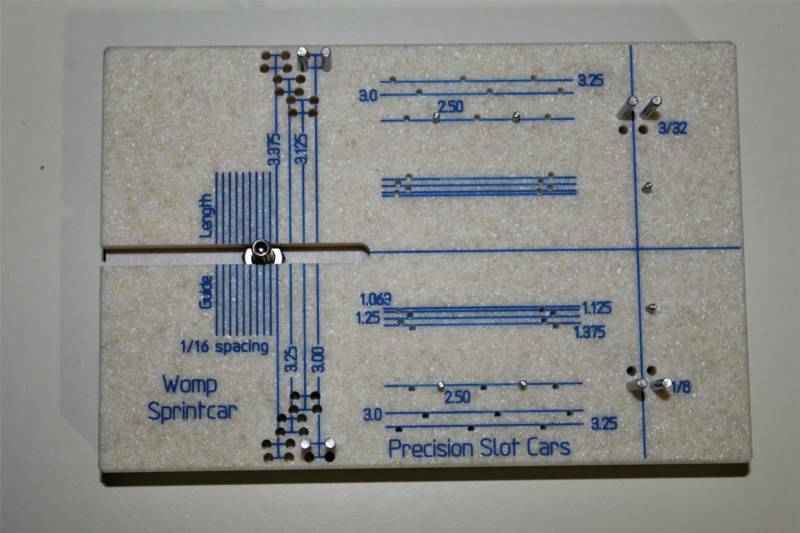 Added feature to Precision Slot Cars chassis fixture's are pins added to locate the front axle. Check to see how tweaked the 1 piece pans are. square to the guide flag. Made of 3/4" solid surface material. The new JK X32 chassis fixture. X32 precision chassis fixture sets your chassis and guide flag perpendicular to the front and rear axles. New added feature of 4 posts for locating the front axle. Be absolutely sure your car runs straight. Get outstanding performance and handling. A must have for any serious racer. Works with 2mm and 3/32" axles. 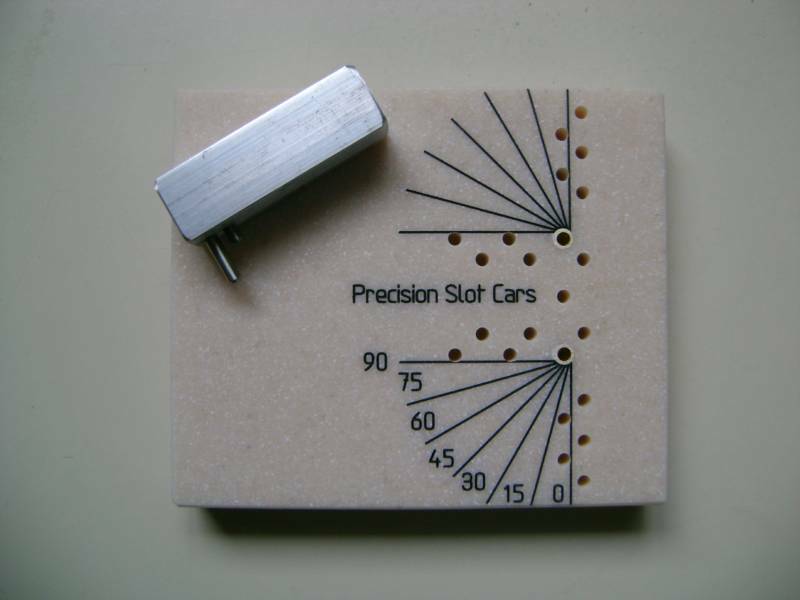 Precision Slot Cars fixtures are the only fixtures available capable of building with 2mm axles. 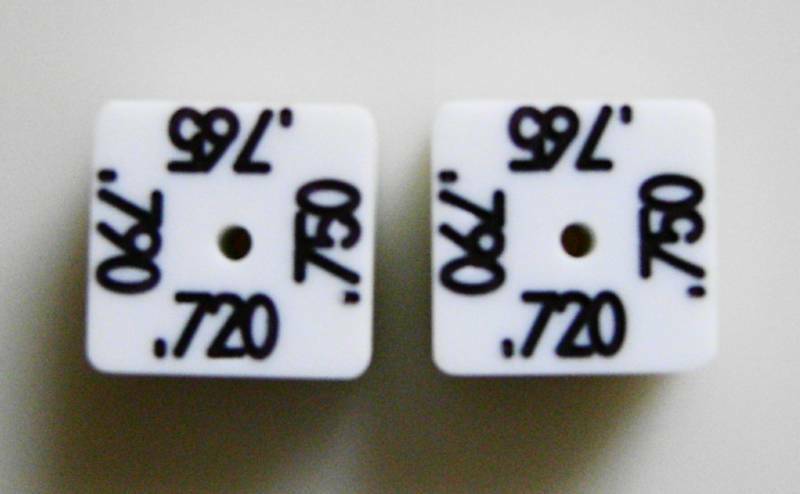 We also stock 2mm axles and 2mm Set-Up wheels exclusive to Precision Slot Cars. Works without removing the pans. Included with the fixture are 8 stainless steel dowel pins for the front and rear axles, 5 stainless steel dowel pins to hold chassis, 1 bolt, washer and nut. Measures 3 1/4" x 5" x 1/2" Corian. 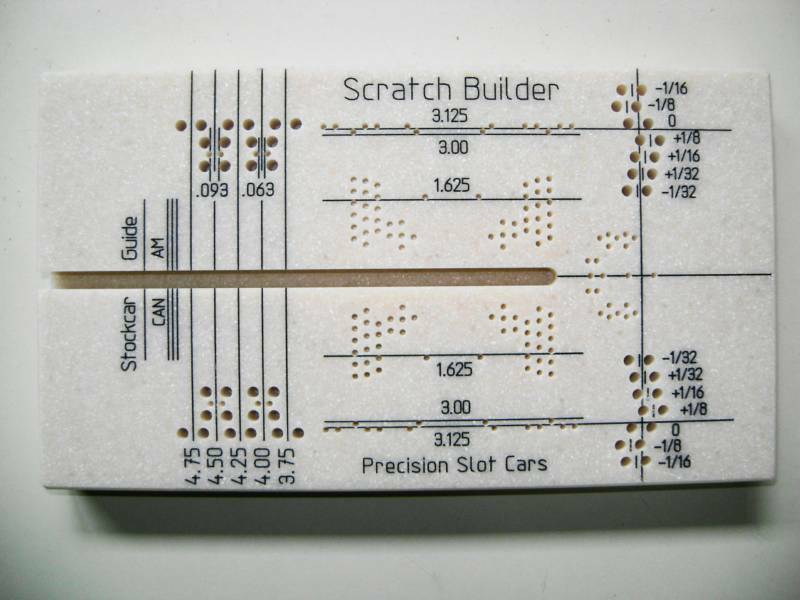 This chassis fixture is also designed for the European rules of slot car racing. Patent pending. 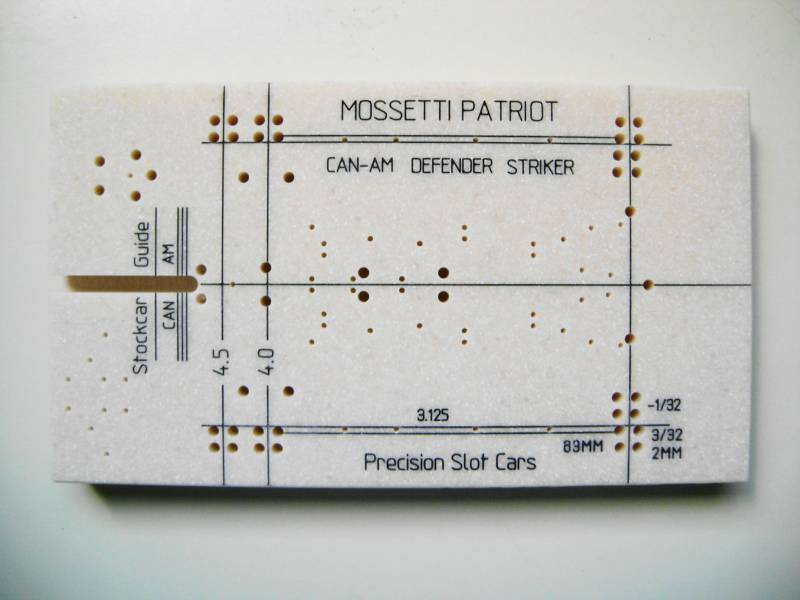 Mosetti Patriot, Striker and Defender precision chassis fixture for flexi style chassis only.Sets your chassis and guide flag perpendicular to the rear axle. Be absolutely sure your car runs straight. Outstanding performance and handling. A must have for any serious racer. For 3/32" and 1/8" axles. Works without removing the pan. Included are 4, 1" stainless steel dowel pins for the axle, 9 steel dowel pins to hold chassis, 1 bolt, washer and nut. Measures 4" x 7 1/4" x 1/2" Solid material. The new Mossetti Builder chassis fixture. CNC machined for high quality and precision. Build the defender,striker and scratch build the patriot can-am retro. sets your chassis and guide flag perpendicular to the rear axle. A must have for any serious racer. Works with 3/32" and 2 MM axles. Works without removing the pans. 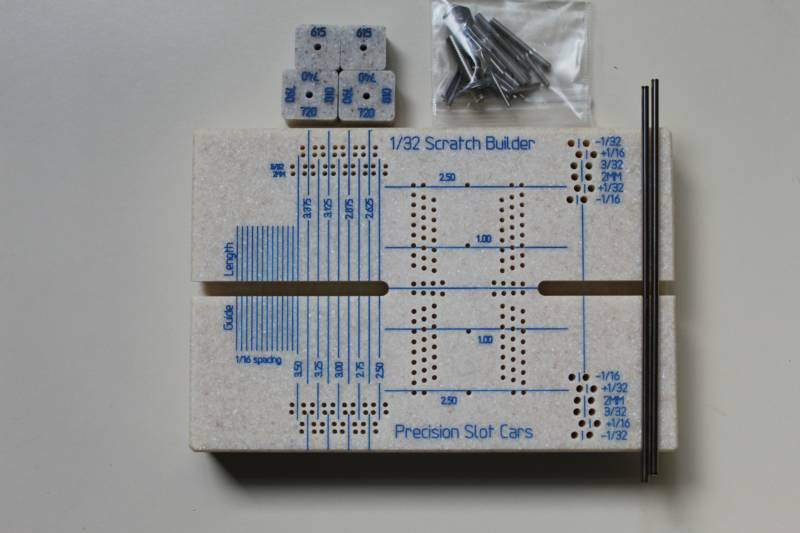 Precision Slot Cars chassis fixture's make racers go faster and built to win! H&R chassis fixture holds all the parts in the adjustable wheel base chassis kit. Build your chassis square and perpendicular to the front and rear axle.Adjustable front and rear. The best generic jig available! Made from PSC's exclusive .790 thick solid material. Three axle post size's 2MM, 3/32", 1/8" Jig Measures 4" x 7.25 x .790 thick. Champion Turbo-Flex precision chassis fixture. Designed to hold chassis and guide flag perpendicular to the front and rear axle. Use 1/8",3/32" or1/16" diameter for front axle. Outstanding performance and handling. A must have for the serious racer. Works with 1/8" and 3/32" axles, 4" and 4 1/2"
chassis without removing the pan. Included are 8 stainless steel dowel pins for the axle, 4 stainless steel dowel pins to hold the chassis, 1 bolt, washer and nut. Measures 3 1/2" x 7 1/4" x 1/2" Corian. Patent pending. 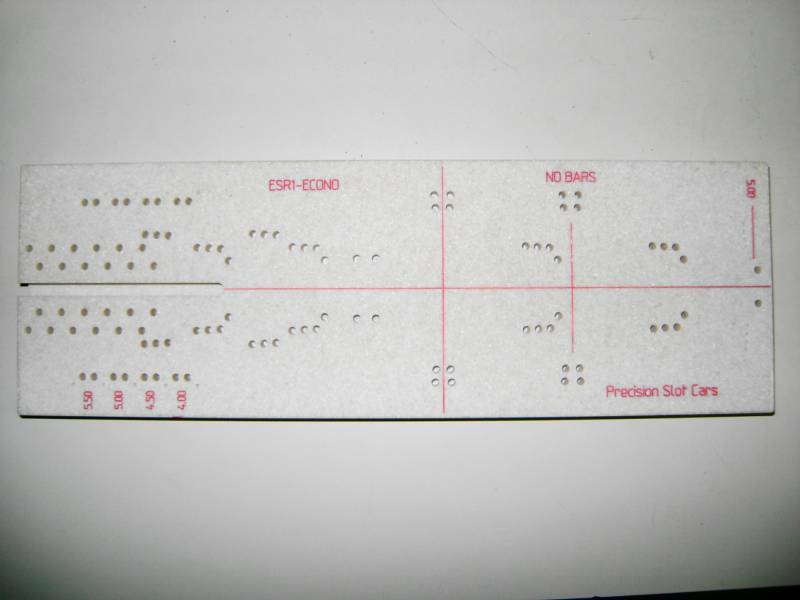 Also available in 3/4" Corain-must send an e-mail for a price quote. FCR precision chassis fixture. Designed to hold the chassis and guide flag perpindicular to the front and rear axle. Posts for setting the front and rear axles in any bushing positions, This will provide improved handling. Works for both 4" and 4 1/2" FCR chassis. Measures 3 1/2" x 7 1/4" x 1/2" Corian. Includes all stainless steel hardware. 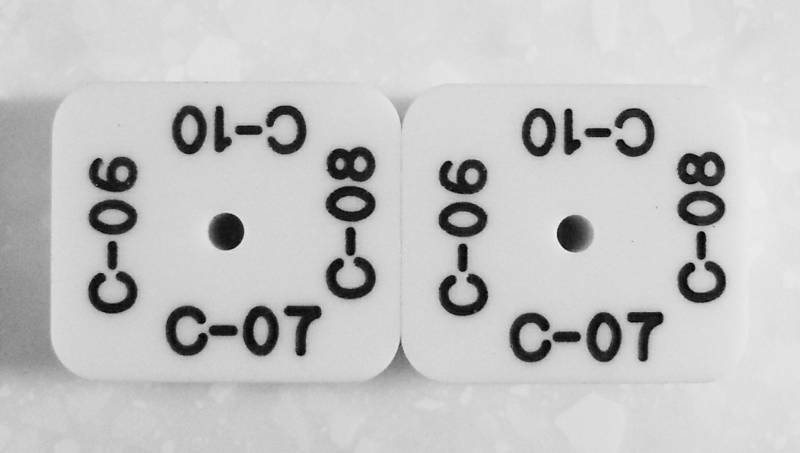 FCR set-up blocks. 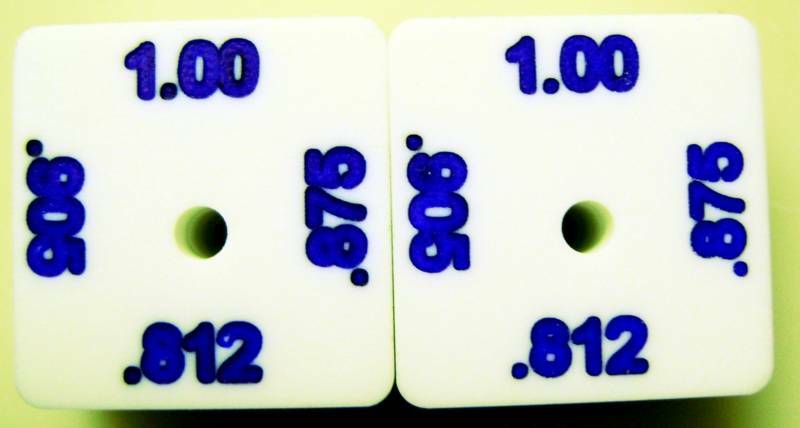 New design set-up blocks sets the clearance to .062. Select the tire size. With the blocks on the axle and the bushings in place, grind or file out the axle uprights until the chassis sits flat on your PSC chassis fixture. The clearance is set .010 higher than tire size so you can practice, break in the tires and still make tech. 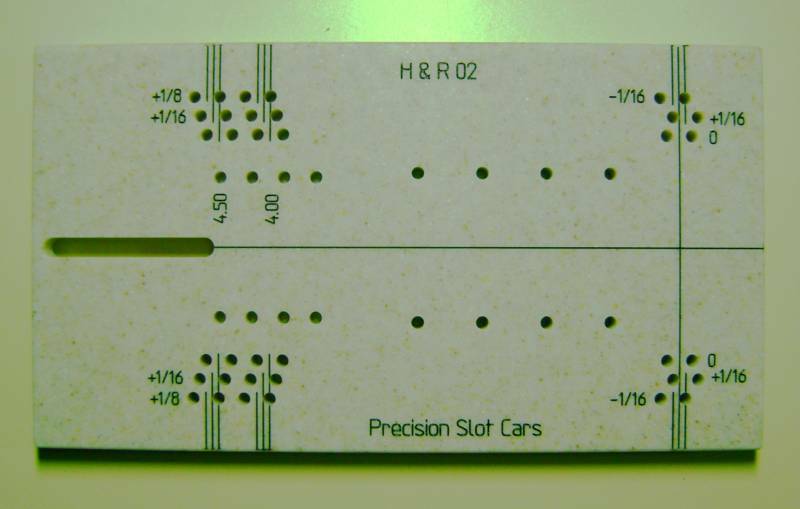 Precision Slot Cars, in support of the F.C.R.- Flexi National championship series has designed a special fixture. 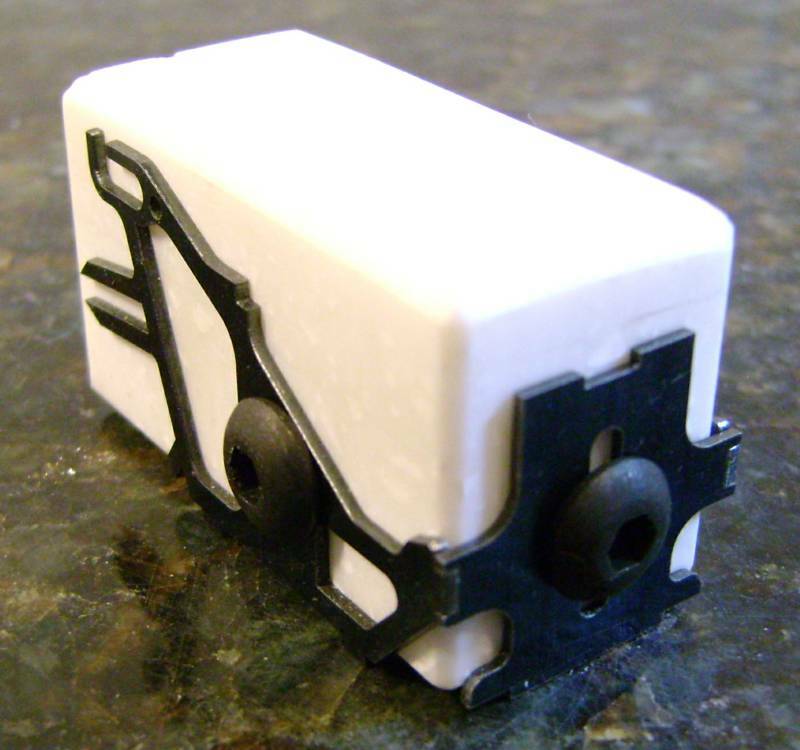 This fixture is designed to work with all the chassis's, specific to the NCS series. This precision chassis fixture has front and rear axle posts for all the different wheel bases of the 4" and 4 1/2" F.C.R. chassis's. Front axle posts for F-5 and Turbo -Flex 4" and 4 1/2" chassis's, 1/8" or 1/16" diameter front axles. Build with 3/32" or 1/8" rear axles. B&E Eliminator chassis fixture,holds all parts in the kit square and perpendicular.Also pins to hold the F.C.R. chassis 4" and 4 1/2" Incluces all stainless steel hardware. 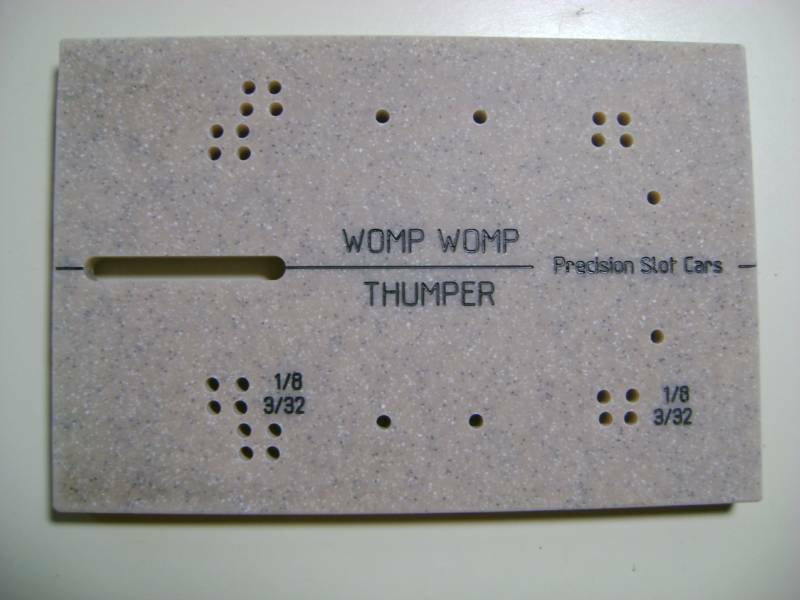 Fixture designed for 1/32 scale Womp Womp/Thumper chassis's.Fits both womps and thumper. Made with solid surface material the fixture measrues 4" x 6" x 1/2" includes 8) 1/8" x 1" stainless steel dowel pins, 6) 1/8" x 1/2" stainless steel dowel pins 1) bolt, nut and washer. For all AWRA womp classes. surface is engraved with all legal widths and wheel bases. Sprint car chassis widths and wheel bases. Has all the features of all our other chassis fixtures,Perfect alignment,straight,square,all stainless steel hardware. Machined perfectly square the Hot Slots 1010-1025 motor block is drilled and tapped to use to hold all the pieces of the motor box.Flip the fixture over for use with 1010 short tire. The new CAD Designed Annihilator chassis fixture.CNC machined for perfect alignment of all the chassis parts in your kit.Build with .062 music wire, .072 stainless tube, .078 music wire or.082 stainless tube. Use this fixture to build awesome drag chassis's! Hold all parts in the kit square and straight. Build like the pros. All pro racers use fixtures and this fixture is the best! Adjustable guide bracket adjusts 1/2' for different length bodies. 4 1/2" wheel base. Sets front and rear axles. Wheelie bar length set at 4.950". Complete kit includes One set of set-up wheel blocks,one motor box fixture Machined perfectly square drilled and tapped to hold all the pieces of the motor box. 8 hardened stainless steel dowel pins for the axles,24 stainless steel dowel pins to hold the chassis parts and main rails.,1 bolt, washer, and nut. Measures 4" x 12" x 3/4" Solid material. 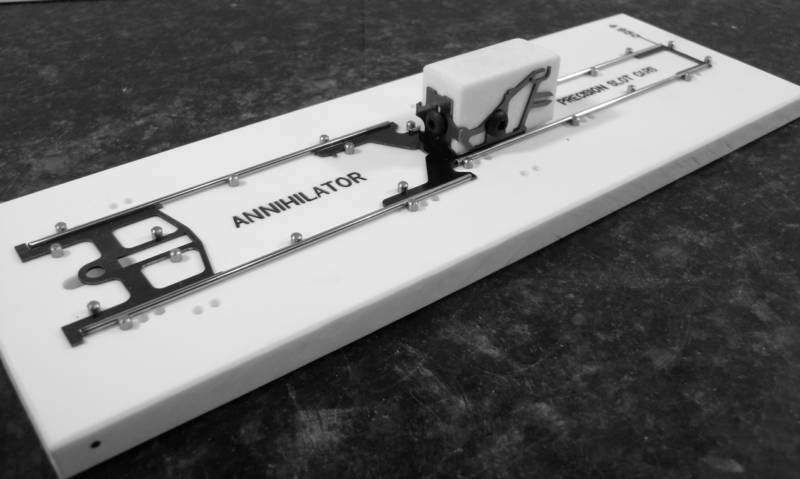 The JDS Annihilator chassis fixture.CNC machined for perfect alignment of all the chassis parts in your kit.Build with .062 music wire, .072 stainless tube, .078 music wire or.082 stainless tube. Use this fixture to build awesome drag chassis's! Hold all parts in the kit square and straight. Build like the pros. All pro racers use fixtures and this fixture is the best! Adjustable guide bracket adjusts 1/2' for different length bodies. 4 1/2" wheel base. Sets front and rear axles. Wheelie bar length set at 4.950". Included: 8 hardened stainless steel dowel pins for the axles,24stainless steel dowel pins to hold the chassis parts and main rails.,1 bolt, washer, and nut. Measures 4" x 12" x 3/4" Solid material. Machined perfectly square the Annihilator motor block is drilled and tapped to use to hold all the pieces of the motor box. Set-up wheels for the Annihilator drag chassis. Use to set axle height on your drag chassis. Sets the axle perfectly horizontal. Gives your drag chassis outstanding performance and straight launches. Made from 1/2" Corian. The JDS Revolution C 08 chassis fixture . CNC machined for perfect alignment of all the chassis parts in your kit. Build with .062 wire, .072 tube, 078 wire or .082 tube. Hold all parts in the kit square and straight. Exclusive feature of this fixture is the bend point for fabricating perfect tapered frame rails.Adjustable guide bracket adjusts for 12 different wheel bases. Sets front and rear axles. Wheelie bar length set at 5.00" Included: 8 hardened stainless steel dowel pins for the axles, 31 stainless steel dowel pins to hold the chassis parts and main rails, 1 bolt, washer, and nut. Measures 4" x 12" x 3/4" Solid material. The new CAD Designed WRP Pro Inline C-02 C-12 chassis fixture. CNC machined for perfect alignment of all the chassis parts in your kit.Build with .062 music wire, .072 stainless tube, .078 music wire or.082 stainless tube. Use this fixture to build awesome drag chassis's! Hold all parts in the kit square and straight. Build like the pros. All pro racers use fixtures and this fixture is the best! Adjustable guide bracket adjusts 1/2' for different length bodies. 10 possible wheel bases. Sets front and rear axles. Wheelie bar length set at 4.950". Complete kit includes One set of set-up wheel blocks,one motor box fixture Machined perfectly square drilled and tapped to hold all the pieces of the motor box. 8 hardened stainless steel dowel pins for the axles, 27 stainless steel dowel pins to hold the chassis parts and main rails.,1 bolt, washer, and nut. Measures 4" x 12" x 3/4" Solid material. The WRP Pro Inline C-02/C-12 chassis fixture. CNC machined for perfect alignment of all the chassis parts in your kit.Build with .062 music wire, .072 stainless tube, .078 music wire or.082 stainless tube. Use this fixture to build awesome drag chassis's! Hold all parts in the kit square and straight. Build like the pros. All pro racers use fixtures and this fixture is the best! Adjustable guide bracket adjusts 1/2' for different length bodies. 10 possible wheel bases. Sets front and rear axles. Wheelie bar length set at 4.950". Included: 8 hardened stainless steel dowel pins for the axles, 27 stainless steel dowel pins to hold the chassis parts and main rails.,1 bolt, washer, and nut. Measures 4" x 12" x 3/4" Solid material. Machined perfectly square, drilled and tapped to use to hold all the pieces of the motor box. Set-Up wheels for the WRP Pro Inline drag chassis. Use to set the axle height on your drag chassis. Sets axle perfectly horizontal. Give your drag chassis outstanding performance and straight launches. Made from 1/2" Corian. Motor block fixture for Kentucky Trash. Holds all the box parts square. 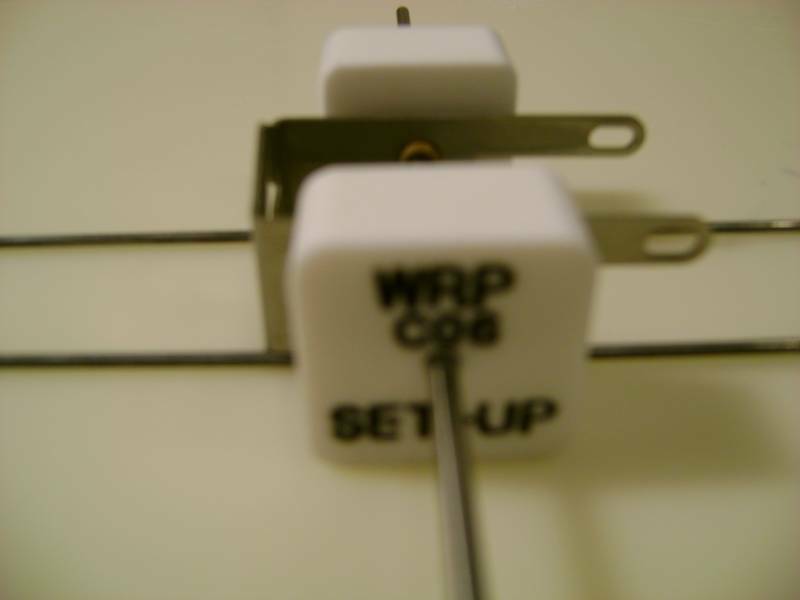 WRP C Series build fixture works for the WRP C-06 , C-07, C-10 and C-08 Sidewinder chassis kits. Use this fixture to build awesome drag chassis's. Hold all parts in the kit square and straight. Build like the pros. All pro racers use fixtures and this fixture is the best! Adjustable guide bracket, Sets front and rear axles to 10 possible wheel bases. Wheelie bar length set at 4.950. Wire bending fixture included for making braces. Designed for 1/16 (.063) music wire. Complete kit includeds One set of set-up wheel blocks, 1 Bend Key, 8 hardened stainless steel dowel pins, 22 stainless steel dowel pins,1 bolt, washer, and nut. Measures 4" x 12" x 3/4" Solid material. 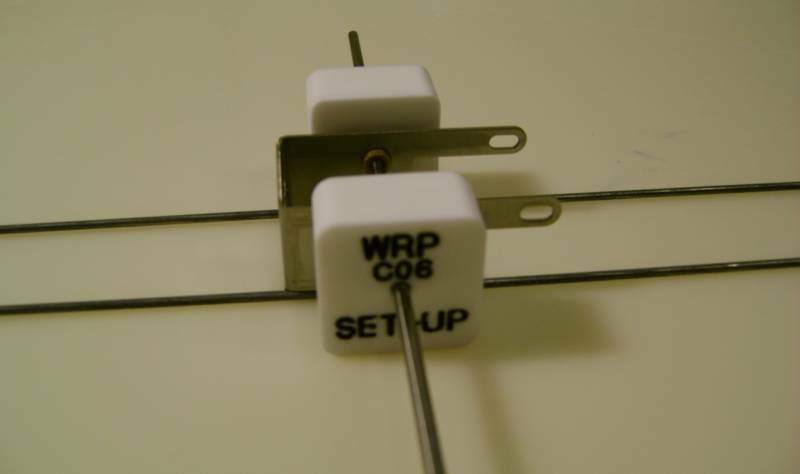 WRP C Series build fixture works for the WRP C-06 , C-07, C-10 and C-08 Sidewinder chassis kits. Use this fixture to build awesome drag chassis's. Hold all parts in the kit square and straight. Build like the pros. All pro racers use fixtures and this fixture is the best! Adjustable guide bracket, Sets front and rear axles to 10 possible wheel bases. Wheelie bar length set at 4.950. Included: 8 hardened stainless steel dowel pins, 22 stainless steel dowel pins,1 bolt, washer, and nut. Measures 4" x 12" x 3/4" Solid material. Set-Up wheels for the WRP C Series C-06, C-07, C-08 and C-10 drag chassis's. Use to set the axle height on your drag chassis. Sets axle perfectly horizontal. Gives your drag chassis outstanding performance and straight launches. Made from 1/2" Corian. Use to set motor bracket, main rails and bushings in your WRP C-06 chassis kit. Sets the axle horizontal to the track. Solder motor bracket square to the main chassis rails. 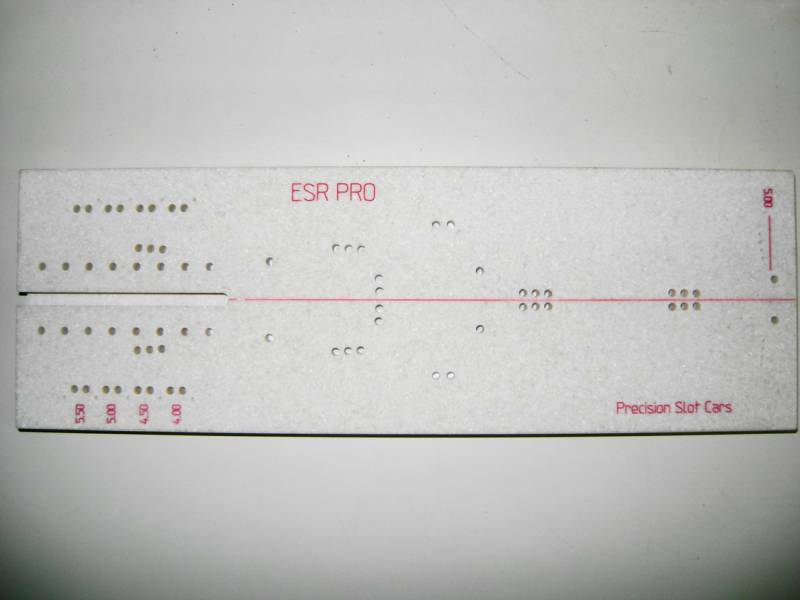 For use with (.072) tubing. Use to set motor bracket, main rails and bushings in your WRP C-06 chassis kit. Sets the axle horizontal to the track. Solder motor bracket square to the main chassis rails. For use with .082 tubing. CNC machined let you build the best chassis possible.The precision machined motor block set all the parts square and true.The set-up wheels set the axle horizontal to the track surface and set oilites or ball bearings straight and square with the axle.Chassis fixture includes (8)1/8 x 1 (28)1/8 x 3/8 stainless steel hardened precision dowel pins for alignment of chassis parts and front and rear axles. (1)Motor block machine perfectly square drilled and tapped to hold all the motor block parts. (1) set of set-up wheels to set axle oillites or ball bearings,10-32 bolt nut and washer. WRP C-01 sidewinder chassis fixture lets you build the best chassis possible. Build with .062 music wire, .072 stainless tube, .078 music wire or.082 stainless tube. Hold all parts in the kit square and straight. Build like the pros. All pro racers use fixtures and this fixture is the best! Adjustable guide bracket adjusts 1/2' for different length bodies. 10 possible wheel bases. Included: (8)1/8 x 1 (28)1/8 x 3/8 stainless steel hardened precision dowel pins for alignment of chassis parts and front and rear axles.10-32 nut, bolt and washer. Holds all the pieces in the chassis kit,square and tight. CNC machining ensures straight chassis for awesome launch and top preformance. Includes board, stainless steel hardware. 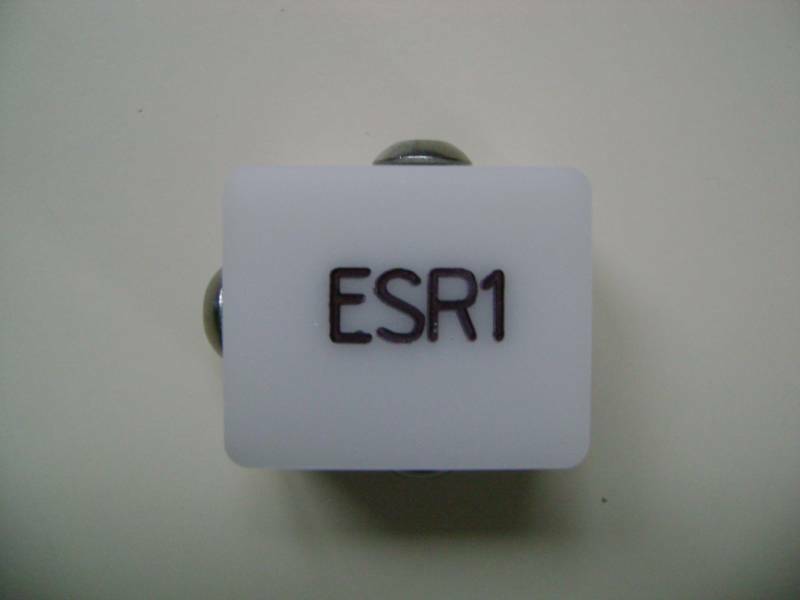 Motcr block fixture for ESR1-econo chassis. Holds all the motor box parts for true, square assembly. Holds all the pieces in the chassis kit,square and tight. CNC machining ensures straight chassis for awesome lauch and top preformance. 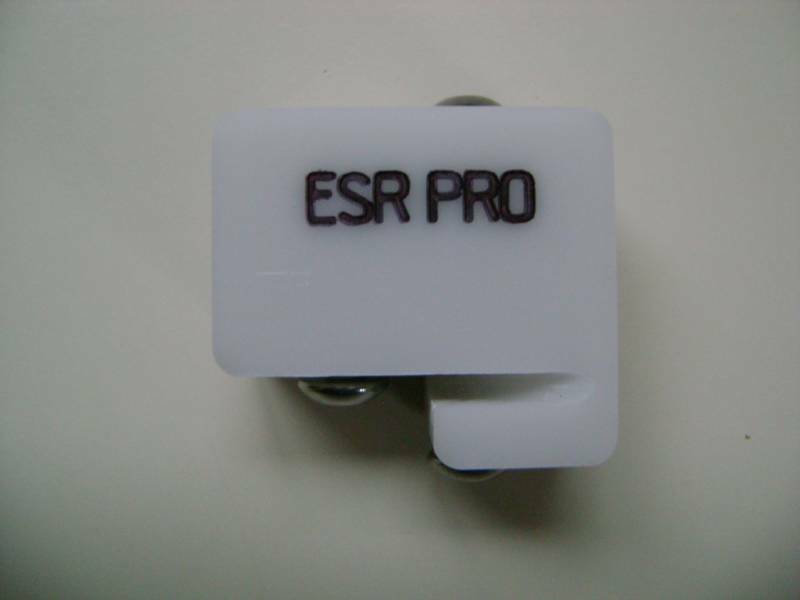 Motor block fixture for ESR Pro sidewinder chassis. Holds all the motor box parts for true,square assembly. The best generic drag jig available! Made from PSC's exclusive 3/4" thick solid material. Two t-slots for holding all your chassis parts. Axle posts for both 3/32" and 1/8" axle builds.Pins set for 5" the wheelie bar length. Jig measures 4" x 12" x 3/4" thick. wall. Mount bodies, change motors. 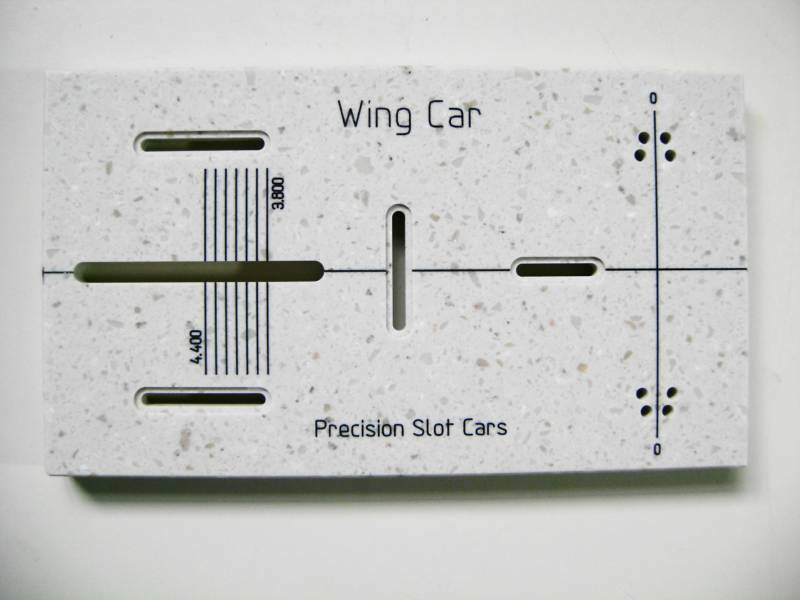 Made of 1/2" Corian, measures 3 1/4" x 7 1/4"
Set-up wheels for drag chassis. Wheels are exact size! Use to set your bodies for your drag chassis. Sets the axle perfectly horizontal. Use with the drag chassis fixture for outstanding performance and straight launches. All the popular size drag tires: 1 1/16", 1 3/16" , 1 5/16", 1.010. Made from 1/2" Corian. Set-up wheels for drag chassis. Wheels are exact size! Use to set bodies on your drag chassis. Sets the axle perfectly horizontal. Use with the drag chassis fixture for outstanding performance and straight launches. All the popular size drag tires: 1 1/16", 1 3/16", 1 5/16", 1.010. Made from 1/2" Corian. Drag race set up wheels with .062 clearance for 1/8 axle. Use to sctratch build drag chassis' Provides .062 chassis clearance while building your chassis flat. Drag race set up wheels with .062 clearance for 3/32 axle. Use to sctratch build drag chassis' Provides .062 chassis clearance while building your chassis flat. 3/32" axle retro class set-up blocks. .812 and .790 sets chassis clearance to .050. Select tire size, with blocks on axle and bushings in place. Grind out chassis uprights until chassis and blocks sit flat on your PSC chassis fixture. .750 and .625 set your front axle at .015 clearance. 8) 1/8" x 1" ss dowel pins, 20) 1/16" x 1/2" ss dowel pins, nut, guide post and washer, 1 set of front jig wheels, 1 set of rear jig wheels and 2 3/32" x 4 1/2" Build Axles. Fixture measures 4 1/2" x 8" x 3/4"
The Tuning Fork version is for Angle winders,Can Am,Formula 1 and Stockcar chassis. you want to build with short wheel bases. You can build + or - 1/16" , -1/8" + or - 1/32" No measuring, no muss, no fuss.The fixture assures that your chassis is absolutely straight, square, perpendicular, and centered. Front axle post for 1/16" axles for the angle winders. 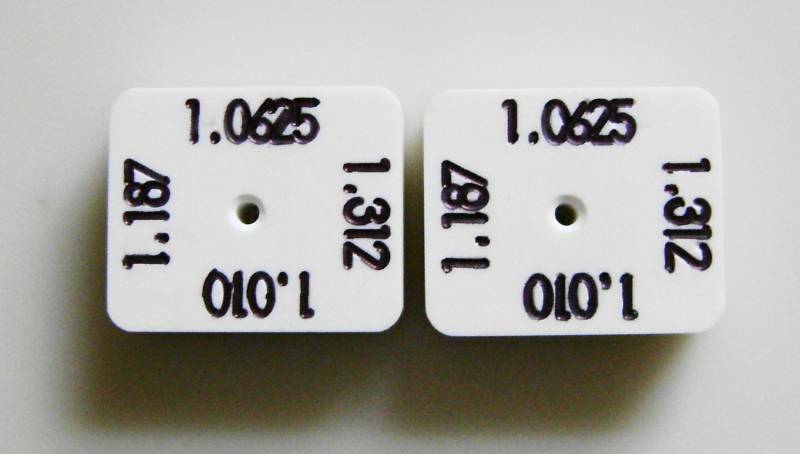 Engraved lines for guide length. Made with 3/4" material that is non thermal form-able material. Includes 8) 1/8" x 1" ss dowel pins, 20) 1/16" x 1/2" ss dowel pins, nut, guide post and washer included. Wire bender designed to bend wire up to 1/16" diameter.Layout displays bend angle and can produce perfect mirror image of your parts. 8) 1/8" x 1" ss dowel pins, 20) 1/16" x 1/2" ss dowel pins, nut, guide post and washer. All NEW REDESIGNED Set-Up Wheel Blocks. Now available for .062 , .050 , .032 clearances. Select the size tires you are going to run. Grind out the rear axle uprights (pillow blocks) until the chassis lays flat on your Precision Slot Car Chassis Fixture. Solder in the oilites. Sets the rear clearance .010 higher than tire size so you can practice and break in the tires and still make tech. If your car handles better after the first few heats then you need these blocks to set the clearance. If your car is sitting higher in the back than another racers car you are giving them an advantage. The lower to the track your car sits the better it will handle. Made from 1/2" Corian. Designed for Hardbody chassis' Front. 1/32 Scratch builder Imperial dimensions. all the stainless steel hardware. 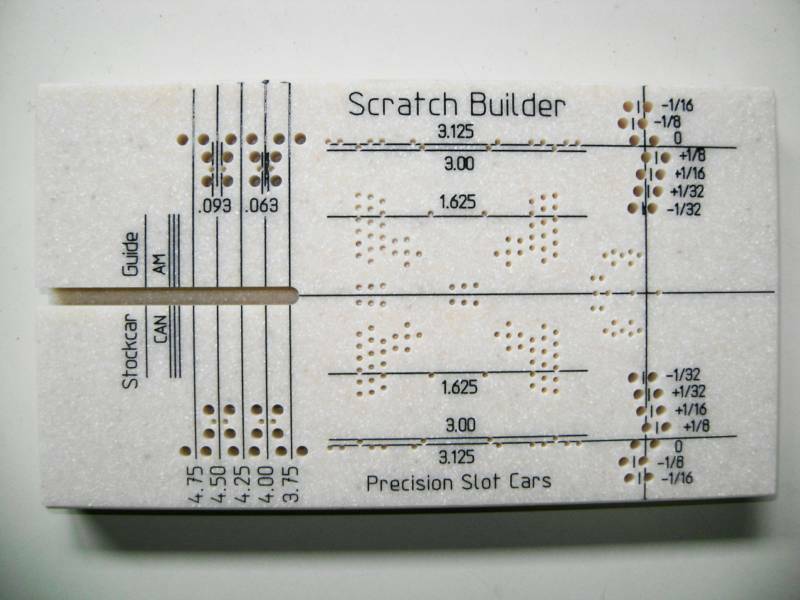 Build all 1/32 scals cars to metric dimensions. Ultra precision 1/8" axle. Special heat treat process that provides wear resistence. Axles are hardened all the way through Rockwell 60-63. Made of high quality American tool steel. Precision ground to a tolorance of +0.0000 -0.0002. A perfect addition to our chassis building fixtures. Ultra precision 3/32" axle. Special heat treat process that provides wear resistence. Axles are hardened all the way through Rockwell 60-63. Made of high quality American tool steel. Precision ground to a tolorance of +0.0000 -0.0002. A perfect addition to our chassis building fixtures. Ultra precision 2mm axle. Special heat treat process that provides wear resistence. Axles are hardened all the way through Rockwell 60-63. Made of high quality American tool steel. Precision ground to a tolorance of +0.0000 -0.0002. A perfect addition to our chassis building fixtures. Ultra precision 1/8" axle. Special heat treat process that provides wear resistence. Axles are hardened all the way through Rockwell 60-63. Made of high quality American tool steel. Precision ground to a tolorance of +0.0000 -0.0002 Available in 10" inch lengths. A perfect addition to our chassis building fixtures. Ultra precision 3/32" axle. Special heat treat process that provides wear resistence. Axles are hardened all the way through Rockwell 60-63. Made of high quality American tool steel. Precision ground to a tolorance of +0.0000 -0.0002 Available in 10" inch lengths. A perfect addition to our chassis building fixtures. Replacement dowel pins for our jig and fixtures. 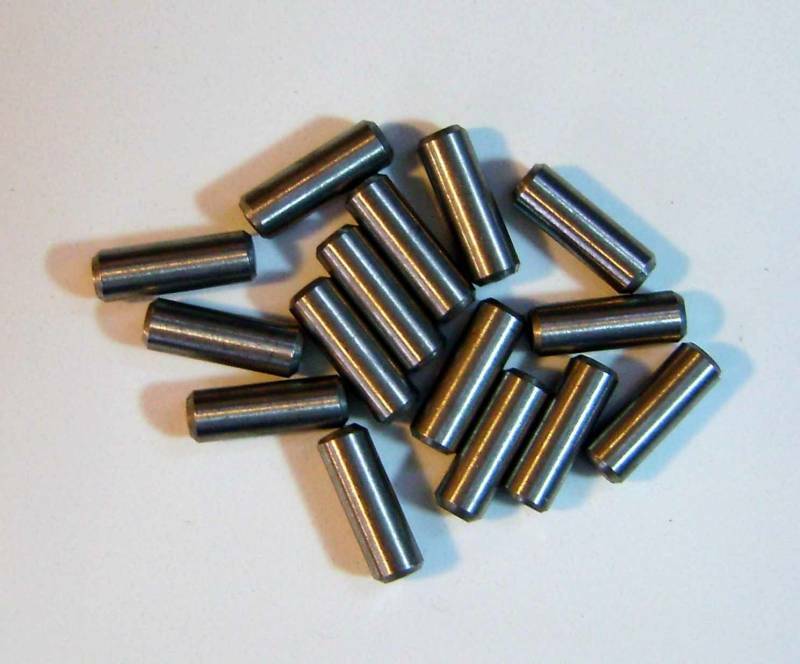 The same high quality dowel pins your jig and fixtures came with. Only available in Stainless Steel. 1/2" length. 5 pc lots. (12) Replacement 1/16" x 1/2" Stainless steel dowel pins. 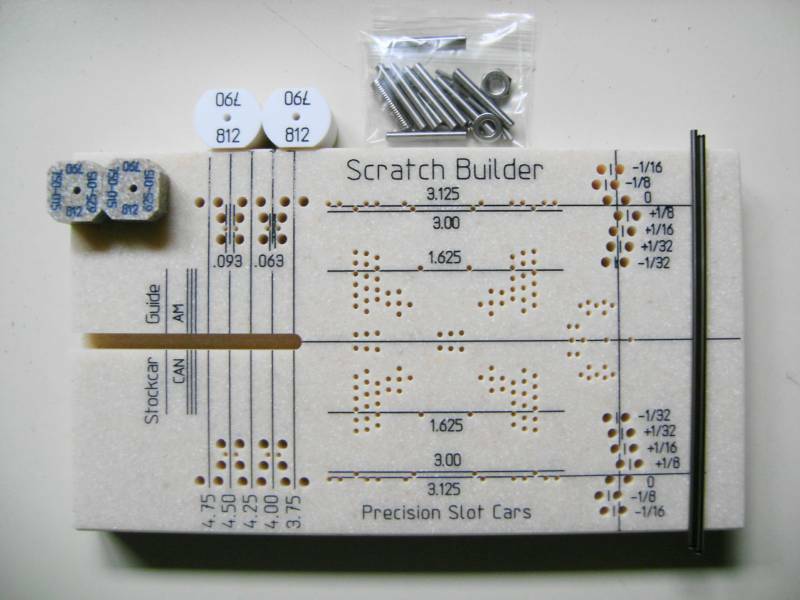 replacements or additionals for all PSC scratch builders. 5" Ultra precision 3/32" build axle. Replacement build axle for Scratch builders,Mossetti builder,any extra wide fixtures or jigs. Axles are hardened all the way through Rockwell 60-63. Made of high quality American tool steel. Precision ground. 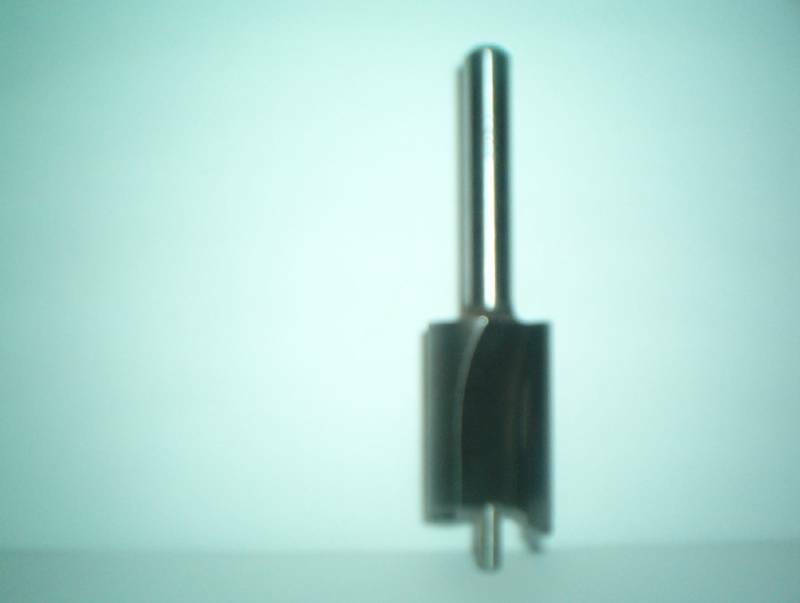 Carbide tipped Custom machined router bit for recessing wood tracks. Great for cleaning out old glue when rebraiding. Available size 3/4" all fit with a 1/8" precision hardened dowel pin, has a 1/4" shank to fit most routers. This is the new wing car fixture. Adjustable for all length wing car chassis even the new ultra short chassis. Included posts for jigging the rear axle bearing uprights. 5 sets 4-40 x3/8 stainless steel screw,nut ,washer. 1 10-32 x 3/4 stainless steel bolt, washer, nut. 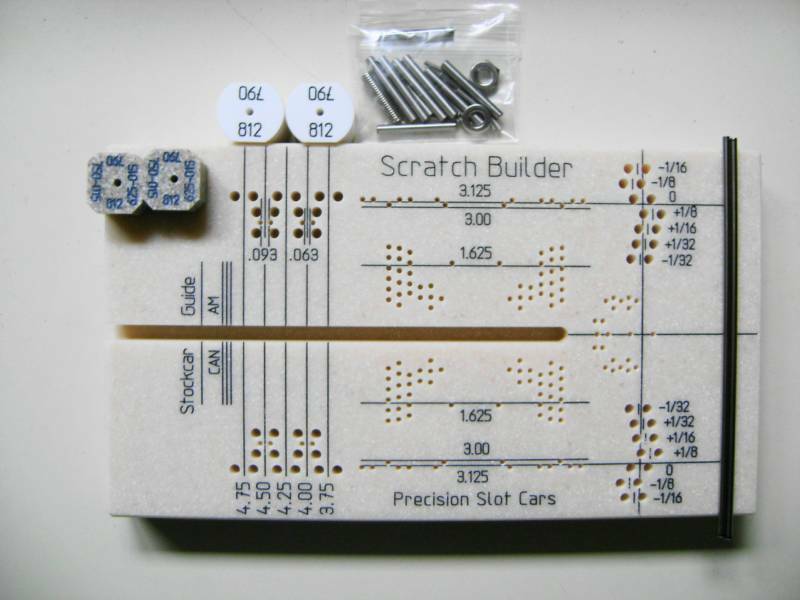 Now you can drill Koford long or short tower aluminum end bells with the Precision Slot Cars drilling fixture. Designed to dial timing from -5' 0-15' in 1 degree increments. Holes are bushed with hardened stainless steel seamless tubing. Base is machined to exact can dimensions. All orders now ship USPS Priority mail for a discounted flat rate.